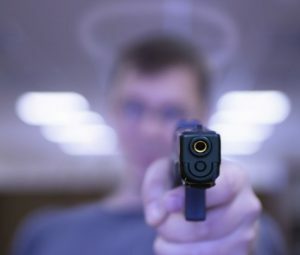 Should Those Convicted Of Domestic Violence Have Any Gun Rights? Should those convicted of domestic violence be banned for life from owning firearms? On June 27th, the Supreme Court ruled against Voisine v. United States, a case that sought to strike down a federal amendment that bars individuals convicted of misdemeanor domestic violence from owning guns. Although the Court’s decision was clearly meant to protect domestic violence victims, the ruling means the perpetuation of an overreaching law that strips away defendant’s Second Amendment rights. Was the Ruling in Voisine v. United States Fair? Stephen Voisine and William Armstrong III, the two Maine men at the center of Voisine v. United States, were both convicted under the Lautenberg Amendment, a federal law which makes it a felony for people previously convicted of domestic violence misdemeanors to own or buy a gun. Those protected under the Lautenberg Amendment include a defendant’s spouse, ex-spouse, a parent to a defendant’s child or someone they lived with. Stephen Voisine pleaded guilty to assault in 2004 after slapping his girlfriend in the face while he was intoxicated. He was convicted under the Lautenberg Amendment several years later, after someone anonymously reported seeing him shoot a bald eagle with a rifle. William Armstrong III pleaded guilty to assaulting his wife in 2008. He was convicted under the gun law a few years later, after police searching his home as part of a narcotics investigation found firearms and ammunition. Lawyers for Voisine and Armstrong argued in Voisine v. United States that their client’s crimes didn’t qualify for the federal gun ban because the men’s assaults were committed “recklessly,” instead of knowingly or intentionally. According to Maine law, a person’s conduct is considered “reckless” when he or she knowingly ignores the risk that their behavior may cause others. Nonetheless, the Supreme Court rejected arguments that the gun ban on those convicted of domestic violence misdemeanors only applies to intentional acts of abuse. Justice Elena Kegan argued that if the Lautenberg Amendment was interpreted to not include misdemeanors in which a person acted recklessly, the purpose of the law would be undermined. After all, the Lautenberg Amendment was designed to protect all domestic violence victims, not just those victims of premeditated abuse. In other words, acting impulsively and in the heat of the moment is not, the court found, an excuse for violence. However, Justice Clarence Thomas disagreed with the majority’s decision, stating that he found it troubling that a misdemeanor conviction could deprive someone of their Second Amendment right to bear arms. Thomas wrote that under the majority of the Supreme Court justice’s interpretation, “a single conviction under a state assault statute for recklessly causing an injury to a family member — such as by texting while driving — can now trigger a lifetime ban on gun ownership.” Justice Thomas’s concerns echoed the opinions of gun-rights activists, who also expressed concern at Voisine and Armstrong losing their constitutional right to bear arms. When you consider Thomas’s point that someone who is convicted of “reckless” behavior that does not even involve a gun could lose their constitutional right to bear arms under the Lautenberg Amendment, the Supreme Court’s decision to uphold the law seems less than fair. Some states have what are referred to as domestic violence wobbler charges—cases in which the prosecutor must decide whether they should try to give the defendant a felony or misdemeanor charge. The type of charge ultimately given to a defendant depends on several factors including the circumstances of the case, the location of the arrest, the nature of the defendant’s relationship with the plaintiff, and the defendant’s criminal history. In some states the line between misdemeanor and felony can be very thin. For example, a commonly charged offense in California (known as Penal Code Section 273.5) includes inflicting physical injury on a cohabitant, spouse, or someone the defendant has dated. This charge is considered a wobbler as the District Attorney can decide to reduce the charges to a misdemeanor if the victim’s injuries are deemed to not rise to the felony level. Another common domestic violence charge, Penal Code Section 245, is often a felony charge, and it is also considered a strike under the Three Strikes Law in California. However, this charge is still considered a wobbler and can be reduced. In California, someone convicted of a felony under a wobbler law can, if they were not sentenced to state prison and successfully completed probation, have their charge reduced to a misdemeanor and have their gun rights restored. While having any sort of criminal record is undesirable, being charged with a felony is much more detrimental to a defendant’s future than a misdemeanor. Someone charged with a felony could lose their right to vote as well as their ability to gain employment in certain fields. In many cases, convicted felons also lose their right to own or buy a firearm. The ruling in Voisine v. United States sends a message to the public that even if you are only charged with a domestic violence misdemeanor, you could face restrictions on your constitutional rights similar to the restrictions placed on someone with a domestic violence felony. Most people are okay with restricting the rights of felons. Now, we are seeing the slippery slope of restricting the rights of those convicted of misdemeanors becoming a reality. The Lautenberg Amendment eliminates, at least at the federal level, the weighing of specific circumstance in deciding how to charge domestic violence wobbler cases. That someone could lose their constitutional right to bear arms because of a misdemeanor (for something like texting while driving with a family member in the car, as Justice Clarence Thomas noted) is disturbing, and sets the stage for further restrictions on the futures of even low-level criminals.